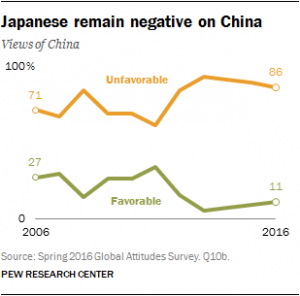 Overwhelming dislike of the Chinese (and vice versa) was once again clearly on display in the latest Pew Research Center (PRC) survey of 1,000 Japanese adults, old and young, conducted late last spring, before the roller-coaster ride over the South China Sea since the summer – the fallout of the Permanent Court of Arbitration’s decision against China’s claims and Philippine President Rodrigo Duterte’s about-face in navigating his country’s relations with China. Only 11% of respondents held a favourable view of China compared with a startling 86% who held contempt for China and Chinese, including 42% who expressed very unfavorable sentiments. Back in 2002, in a similar PRC survey, 55% of Japanese had a positive view of China. By comparison, Japan’s views of South Korea are somewhat better with 27% voicing favourable sentiments, though down significantly from the high of 56% a decade ago. Overall, over 2/3 (68%) of Japanese hold an unfavourable view of the Koreans that include one in four who held very negative views. This is hardly surprising given Japan’s lack of atonement on past abuses and atrocities perpetrated on the Korean Peninsula; namely, the use of tens of thousands of comfort women for army brothels during WWII and the legion of forced Korean (and Chinese) labourers for Japan’s wartime industries, and on top of that, territorial disputes. The only major Asian country that the Japanese have positivity in their hearts for is India. No doubt, this stems from the fact that Buddhism emerged from India, the Indian justice’s dissenting judgement in favour of accused war criminals at the Tokyo Trials, and that the country poses no threat to Japan, either economically, being a poor country, or militarily, given India’s fears of China. The PRC report summarizing the survey attributed the troubling results to being “a manifestation of Japanese fears of a military confrontation with China”. It cites the finding that eight in ten Japanese fear territorial disputes between the two countries could lead to military conflict. However, what’s often been missed in the Western and Japanese press and polling institutions as well is feelings of frustration due to perceptions of dramatic comparative economic decline in the face of the Chinese juggernaut on the part of many Japanese, particularly the young who no longer enjoy lifetime employment working for Japan’s largest conglomerates. With unfavourable views at all-time highs, the Japanese are nonetheless split on how to best deal with their superpower next door. 47% answered maintaining a strong economic relationship with China is the best policy whereas 45% believed a tougher stance on territorial disputes is better. In stark contrast, 72% of Japanese hold special feelings for the US that has been fairly consistent going back a decade. Their positive take on the US, however, does not translate into an optimistic view of their political master’s trajectory on the world stage. Over 60% (61%) responded that the US is now less powerful and important as a world leader than a decade ago. 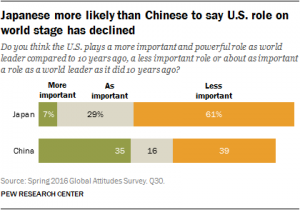 By comparison, only 39% of Chinese people (in another survey) felt the US is less important than previously. 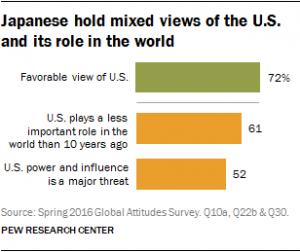 `What’s more interesting and perhaps paradoxical is that despite their positive outlook on Japan’s most important political and military ally, roughly 1/2 of those polled perceived the power and influence of the US constituted a major threat the country. Ironically, almost 2/3 of young Japanese aged 18 to 34 (63%) were more inclined to hold this view than those 50 years or older (47%). Additionally, a large segment of the population (61%) sees America in decline, a harsher judgement than for China. In the same breath, 61% said the US remains the strongest nation in the world economically with China coming in a distant second with 24%. Only 6% of Japanese saw their country as a world economic leader. In line with this pessimistic view of Japan’s economic place in the world is public perceptions of Japan’s role in the world community. Only 24% believe Japan plays a more important role in world affairs than 10 years ago while 39% said Japan has held its position and just over a third said their country plays a less important role. 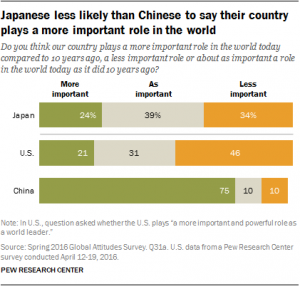 In comparison, 21% of Americans and 3/4 of Chinese respondents felt their countries have become more important. 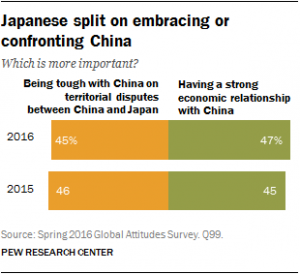 But, despite their diminishing view of their country’s world footprint, 59% of Japanese feel Japan should help other nations deal with their problems compared with 35% who believed Japan should deal with its own problems first. Currently, Japan commits 0.22% of its GDP to foreign aid compared to 0.17% for the US and 0.71% for the UK. Finally, despite their more hawkish stance toward China, the Japanese remain cautious about the country’s military adventures overseas with nearly 2/3 (62%) saying Japan should limit its military role in the Asia-Pacific compared to just 29% who said the opposite, albeit up 6 percentage points over last year. Due to its pacifist constitution which Prime Minister Abe wants desperately to overturn, Japan’s military spending is limited to 1% of GDP. Of those surveyed, only 29% wanted to raise defense spending, and about 1/2 (52%) wished to keep military expenditures about the same level while 14% preferred a decrease. Japan’s military spending compares to nearly 4% by the US, over 4.5% by Russia, and around 2% for China.